Ethel Buell in her garden, 1932, photograph by the National Endowment for the Arts, courtesy of Cynthia Mulcahy. 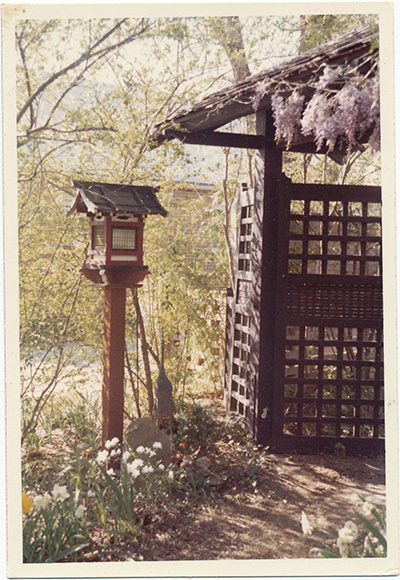 Cynthia Mulcahy research (Wood lantern with electric light) and entrance gate in Ethel Buell’s Oklahoma garden (12 of these lanterns and the entrance gate were installed in the Japanese Garden at Kidd Springs. Most major American cities have Japanese gardens. In Texas, you can find them in Fort Worth, Houston, Austin, San Antonio, and Fredericksburg. Dallas forgot about the one it had, but thanks to local artist Cynthia Mulcahy and a concerted community effort, there is a long-term plan to restore it. Kidd Springs Park in Oak Cliff is a cherished public green space. It has a spring-fed lake, meticulous stonework, unique topography, a surprising amount of wildlife, and a rare variety of tree species. It also has the oldest works in the Dallas public art collection, but the history of that art has been lost. There is no signage identifying the works and the recreation center doesn’t offer any information about it, either. A few years ago, conceptual artist Cynthia Mulcahy, who lives nearby, received public funding for Performance as Gesture: Songs for a City Park, a research-based public art project that enabled her to uncover the forgotten history of the Japanese Garden in Kiss Springs Park. 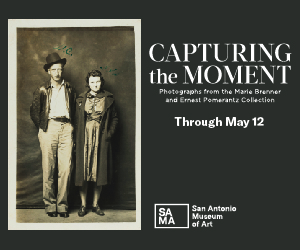 She spent an enormous amount of time going through public archives and began to find a rich history within the pages of the Parks board letters, turn-of-the-century publications, New York Times society pages, and landscape contracts. She learned that in 1928, a master craftsman in Japan built a Japanese bridge, an entrance gate with swinging doors, and a 12-foot Torii gate in the water. All made of wood, which presumably rotted, these works are now gone. The craftsman also built a teahouse that eventually burned down. At one time, there were three Buddhist sculptures; one went missing, but the remaining two are from the 17th century. When she started her research, Mulcahy found one of these two sculptures leaning up against a tree, and the Office of Cultural Affairs (OCA) reset it with a larger base. These two works are the oldest works in the entire collection and are now officially part of the City of Dallas Public Art Collection. Japanese bridge in Japanese Garden, 1971. Courtesy Dallas Park and Recreation Department. 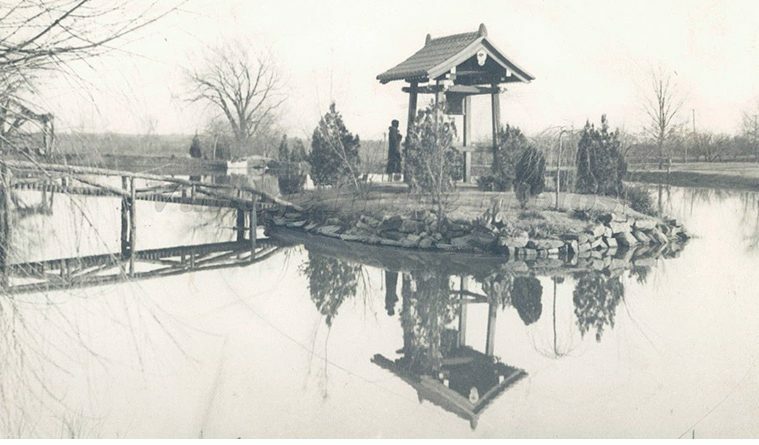 Ethel Buell, an oil heiress from Oklahoma, started collecting Japanese art in Muskogee in the 1920s and created a ten-acre Japanese garden. After prohibition ended in 1934, she threw huge parties on the rooftops of New York City skyscrapers to celebrate her incredible garden. Buell offered the Japanese garden art collection to Tulsa’s Philbrook Museum of Art in the 1950s—a time when Japanese-American discrimination was prominent. They passed on her offer, and Buell died in 1964. Her daughter, who had fond memories of visiting Dallas with Buell to shop at Neiman Marcus, offered it to the Dallas Parks Department, who bought it for $5,000. An Edo Period Buddhist temple bell alone was worth at least triple that sum, but it can no longer be accounted for. The ambitious landscape project for Kidd Springs Park took years to plan and complete. 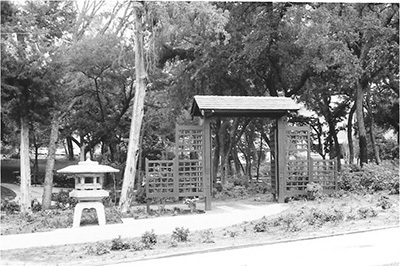 The Japanese garden formally opened in 1971, then known as an “Oriental Garden.” Mulcahy says there were once three Parks Department employees who maintained the garden. But after budget cuts for park maintenance in the late ’80s, the garden started to decline. The collection includes a ten-foot pedestal lantern sent to the 1933 World’s Fair in Chicago by the Japanese Emperor’s government. “I don’t know the exact date of that lantern,” Mulcahy says. “It could be Meiji period or Edo period.” Five of 12 wooden lanterns from the Japanese garden were rediscovered in 2016. Bought by Buell during her last trip to Japan in 1958, they had been hanging in storage for 26 years. These Japanese lanterns were thought to be birdhouses that were never thrown out. 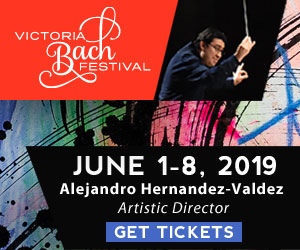 “It’s really fantastic to see so many cultural communities embracing this,” Mulcahy says. Mulcahy joined the board of the Friends of Oak Cliff Parks (FOCP), a citizen activist group formed in 2002 to help the Dallas Park and Recreation Department (DPRD) restore and maintain horticulture in four Oak Cliff parks. DPRD board member Barbara Barbee has been with FOCP since the beginning and says they have volunteered 4,000 hours a year. 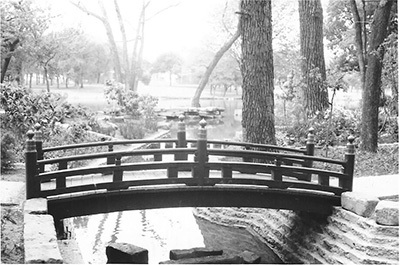 Now the FOCP is focused on efforts to restore the Japanese Garden at Kidd Springs Park. The Crow Collection recently donated Japanese lanterns and landscaping materials were recently donated from the Asian Art’s gardens around the Trammell Crow Center. Other Japanese Garden Committee community partners include the OCA, Dallas County Master Gardeners, Edith O’Donnell Institute at the University of Texas at Dallas, Japan-America Society of Dallas-Fort Worth, Old Oak Cliff Conservation League, and Texas A&M AgriLife Research/Water University. In December, the DPRD fixed the pump for the streambed at Kidds Springs Park, which had been out of service for several years. DPRD director Willis Winters says they are also working on a proposed bond referendum to help restore what is now officially the only public Japanese garden in Dallas.